So you’re growing a herb garden for the first time? 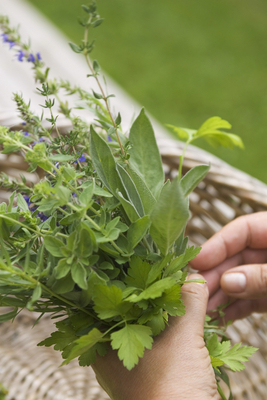 This primer shows you all the basic information needed to help you preserve your herbal harvest. Harvest in the morning of a hot and dry day–wait until the dew is off the plants. Snip off the top growth–about 6 inches of stem below the flower buds. If the leaves are clean, don’t wash them–oils are lost in the washing process. If they are dusty, wash briefly under cold water. Hang the bunches (upside down) in a warm, dry place that is well ventilated and free from strong light. To prevent dust from accumulating, put them in a brown paper bag that you’ve punched some holes in to increase circulation. If you don’t hang them up, remove the stems and dry them on baking sheets, window screens covered with clear sheeting or cheesecloth, or even on a towel. Patchouli Fragrant tender perennial herb producing an oil used in perfumery…leaves emit an exotic incense – grows to approx 12 inches; likes sun to part shade. Herbs should be stored in a cool place, out of strong light, either in dark glass jars, in tins, or behind cabinet e-mail box every Fridays. It’s best to throw them out after a year and restock with new ones. Blanch herbs before freezing them. Hold them by their stems with tongs and dip them in boiling water briefly, swishing them around a little. When their color brightens, remove them from the water. Blot dry with towels. Remove the stems, chop if you wish, or leave the leaves whole. Lay the dried herbs out in a single layer on wax paper and roll or fold the paper so there is a layer of paper separating each layer of herbs. Then pack, paper and all, in freezer bags or wrap in freezer-rated plastic wrap. To use, break off as much as you need and use frozen. You can also thaw them out in the refrigerator–they will keep for about a week.